Jon Bon Jovi and the Kings of Suburbia performed at the Hard Rock Hotel in Las Vegas last weekend. Were you at this show? Bon Jovi returned to Lubbock for the first time in almost a quarter of a century, playing a short, hits-heavy (but no Always!) set that featured only three songs from the new album. This concert also marked the end of the first leg of the Because We Can Tour -- the band will now take a couple of weeks' break before resuming the tour in Calgary on April 2. Bon Jovi made an appearance on American Idol on March 14 (I guess it would have been a previously recorded segment because they had a show in Louisville that night), performing Because We Can to promote the newly released What About Now. 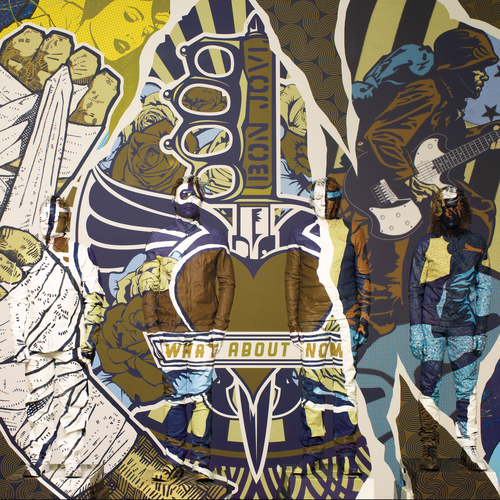 Bon Jovi played in St. Louis for their first show since the What About Now album was actually released in the US... I would have personally liked a couple more new songs in the set but the biggest surprise probably ended up being the return of "Superman Tonight", while "Whole Lot of Leavin'" also made a comeback and "Always" was dropped. @bonjovi #AskSambora what do you guys do to prepare yourself for such long tours?
. @s_6b A stratocaster or a Les Paul!
. @kawee6281 Probably not! I like it too much. @bonjovi #asksambora LOVE the new album! Thick As Thieves couldbe my hubby and I but who was the real inspiration behind that lovely song?
. @patriekawell obviously the inspiration in my head, I was thinking about Jon and his wife. Also the energy of it.. the band, you know?
. @dcfanjane You know, I'm pretty sure we will! Bon Jovi played Living in Sin for the first time on the Because We Can Tour during their March 10 show in Columbus. Here's a video. Do you think they should play it more often? What is your favourite new song? Bon Jovi streamed their Cleveland concert in its entirety online and it was a pretty good webcast and show, even though Jon's voice was nowhere near its best. I loved the ad libs in Saturday Night, and appreciate the extra effort of singing Always when he looked ready for a rest. Bon Jovi played Always for the second night in a row (and second time on the Because We Can Tour)! The set list had "Always or I Love This Town" written down as the final song, but they ended up playing both. Were you at this show? What About Now is released this week. Bon Jovi's trip to Charlotte included the long-awaited return (and tour debut) of Always (which I still maintain should be a concert staple). Even more surprising, Hey God was an audible on the set list along with When We Were Beautiful, Army of One and What's Left of Me. Bon Jovi headed to Florida to kick off Spring and streamed the first 10 songs online. If you missed the webcast, you can watch it here or catch the re-broadcast on Radio.com on March 9. After the official broadcast ended, a Bon Jovi diehard named Ridge Collins picked up the slack with a highly entertaining Ustream from his phone. Between knowing every word (and identifying each song within a couple of seconds), counting the "alrights" in Who Says You Can't Go Home (there were 50, by the way) and narrating all the action ("air clap, air clap"), he showed us all exactly how to enjoy a Bon Jovi concert even when the set list isn't as mindblowing as we wished it could be. Bon Jovi heads to Fort Lauderdale for Jon's 51st birthday tonight, and our man Ridge will be there too.